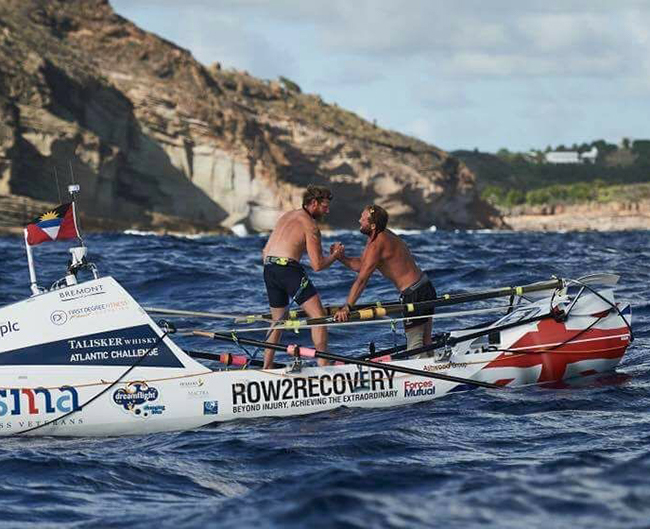 First Degree Fitness are proud sponsors of Row2Recovery Team Trident who completed what is known as the world’s toughest row – travelling 3,000 nautical miles from La Gomera to Antigua. 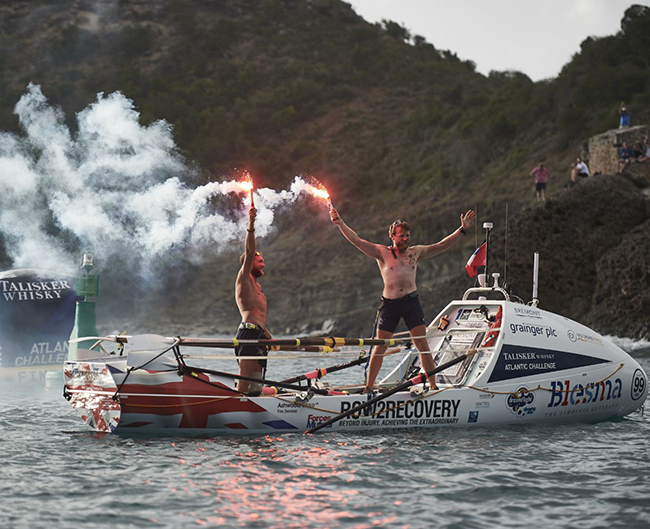 Not only did Captain Jon Armstrong and Lance Corporal Jordan Beecher become the world’s fastest pair to row the Atlantic Ocean on 17 Jan 2018, they smashed the current world record by three days, eight hours and eight minutes. In backing the dynamic duo’s training advantage, FDF provided Jon and Jordan with the equipment that would best support them for the enormous challenge ahead. To prepare for the ocean row, Team Trident trained religiously on two FDF Viking Pro indoor rowing machines, which at maximum resistance provide a close simulation to on-water rowing on a calm ocean. Having the opportunity to build their strength and endurance using FDF’s patented fluid force technology, Jon and Jordan gained a competitive advantage by ‘rowing better’, despite being older and less experienced seamen. “It could be said that the Viking Pro indoor rowing machine is built for coastal rowing training, combining the optimal power curve with a realistic fluid resistance that is capable of preparing an athlete’s physical condition for harsh sea conditions. We are absolutely delighted for Team Trident’s remarkable achievement and it has been a real privilege to back these record breakers,” commented Nick Driscoll, FDF’s Chief Executive. If you think you are ready to take on an ocean challenge like Row2Recovery’s Team Trident, or just interested in giving coastal rowing a go but don’t know where to start, read Jordan’s final reflection on how the Viking Pro enhanced their rowing advantage below. Unsurprisingly, less than a week since Jordan and I landed in Antigua, we are still trying to adjust to life back on dry land. After so long at sea our bodies are unaccustomed to real food, walking on ground that doesn’t move and being with more than one person at a time. Day to day tasks have become eventful, including the plane journey home. When the plane jolted mid-flight I, having been fast asleep and now thinking we were capsizing, jumped out of my seat, tore open the curtains and shouted something incomprehensible. Thankfully the cabin crew were out of earshot and so I wasn’t restrained, but from the looks on some of the other passengers’ faces I am sure I caused more than just a little stress! We are only now starting to reflect on the row but the reality is that this endeavour has occupied our lives for the past eighteen months. It will therefore take a bit of time to reflect, decompress and then realign onto our next challenges at home, work and perhaps, in time, back in the wilderness. From the beginning of this journey neither of us openly stated that we wanted to win the race. The fact of the matter is that competitive ocean rowing is full of variables. No too teams have the same equipment, training, weather data, experience or luck and so standing at the start line it is extremely difficult to make an assessment of which teams are going to be the ones to beat. That being said, coming from an army background both Jordan and I have an inherent competitive streak and a desire to win. From the outset, we knew that the competition would be tough, in the months that led up to the race both Jordan and I trained hard, meticulously planned and prepared so that nothing that we could influence was left to chance. Physical training took the form of many hours in the gym strengthening our backs, legs and core so that we would be able to endure prolonged periods of physical stress. Although many people said that we shouldn’t put much effort into rowing on a machine, Jordan and I wanted to train in the same way we would be competing. We were extremely fortunate to have been supported by First Degree Fitness, and although I would not say that the Viking Pro rower was the single factor that won us the race, it certainly put us at an immediate advantage compared with the competition. We found early on that using total resistance almost exactly emulated the weight of our fully laden ocean rowing boat, and so at the start line we knew what to expect, whereas others went in completely blind. Of course, nothing can compare you for storms, waves, and the intensity of the sun but it was more than comforting on a calm night to hear the familiar sound of water being pushed away as we propelled ourselves 3,000 miles across the Atlantic Ocean. For those who aspire to row an ocean, get in shape, achieve a new personal best, improve strength and especially those who want to break records, both Jordan and I agree that indoor rowing is an extremely effective way of preparing. The FDF line of indoor rowers is a great place to start, providing a total body workout at every training session, and you can have confidence that every minute you spend listening to the water going around the tank, feeling the power you generate through your legs, back and arms is time well spent. Good luck! The question everyone has been asking is “what’s next?” and the answer is that we are both not entirely sure. The problem is that with adventuring comes an addiction to living life on the edge and try as we may, Jordan and I will always long for the feeling of isolation, the simplicity of life and the camaraderie that is built at the ends of the world. We hope that through our endeavour we have shown that you do not have to be superhuman to achieve great things – train hard, fight harder and you will succeed. It will be some time before we return to the ocean but I sense that it won’t be long before we are picking up our skis and trek across Greenland, or saddle up and cycle across the Australian outback.